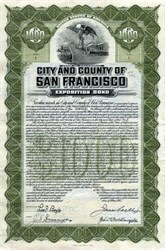 Beautiful certificate #1 from the City and County of San Francisco issued in 1912. 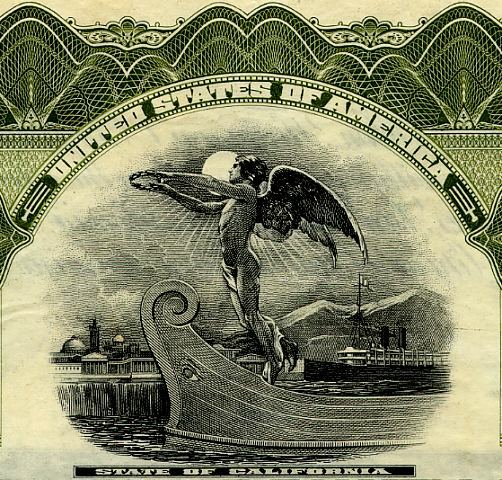 This historic document was printed by the Security Banknote Company and has an ornate border around it with a vignette of an angelic man standing with his arms outstretched on a boat basking in the moonlight. This item has the signatures of the City's Mayor, James Rolph and Treasurer, John E. McDougald and is over 87 years old. James Rolph, Jr. (August 23, 1869 � June 2, 1934) was an American politician and a member of the Republican Party. He was elected to a single term as the 27th Governor of California from January 6, 1931 until his death on June 2, 1934 at the height of the Great Depression. Previously, Rolph had been Mayor of San Francisco from January 8, 1912 until his resignation to become governor. Rolph remains the longest serving mayor in San Francisco history. James Rolph was born in San Francisco on August 23, 1869. He had one younger brother. After attending school in the Mission District, he went to work as an office boy in a commission house. He entered the shipping business in 1900, by forming a partnership with George Hind. He would over the next decade, serve as president of two banks, one of which he helped establish. Although he was asked to run for mayor in 1909, he chose to wait until 1911 to run for mayor � a position that he would hold for eighteen years. As mayor, he was known as "Sunny Jim" and his theme song was "There Are Smiles That Make You Happy". In 1915 he appeared as himself in an early documentary film titled Mabel and Fatty Viewing the World's Fair at San Francisco, which was directed by and starred Fatty Arbuckle. In 1924, Rolph appeared as himself in a Slim Summerville comedy short film, Hello, Frisco. In addition to his mayoral duties and overseeing his shipping interests, he directed the Ship Owners and Merchants Tugboat Company, and the San Francisco Chamber of Commerce. He also was vice-president of the Panama-Pacific International Exposition and president of the Merchants' Exchange. He resigned in 1931 to assume the office of Governor of California. Rolph received considerable criticism for publicly praising the citizens of San Jose following the November 1933 lynching of the confessed murderers of Brooke Hart, while promising to pardon anyone involved, thereby earning the nickname, "Governor Lynch". After suffering several heart attacks, he died in Santa Clara County on June 2, 1934, three years into his term. He is interred at Greenlawn Memorial Park in Colma, California. The official name of the San Francisco � Oakland Bay Bridge is the James "Sunny Jim" Rolph Bridge. The Panama-Pacific International Exposition (PPIE) was a world's fair held in San Francisco, California between February 20 and December 4 in 1915. Its ostensible purpose was to celebrate the completion of the Panama Canal, but it was widely seen in the city as an opportunity to showcase its recovery from the 1906 earthquake. The fair was constructed on a 635 acre (2.6 km�) site in San Francisco, along the northern shore now known as the Marina. The centerpiece was the Tower of Jewels, which rose to 435 feet and was covered with over 100,000 cut glass Novagems. The 3/4 to 2 inch colored "gems" sparkled in sunlight throughout the day and were illuminated by over 50 powerful electrical searchlights at night. At the west end of central court group was the Palace of Fine Arts. Further west toward the bay down The Avenue of the Nations were national and states' buildings, displaying customs and products unique to the area represented. At the opposite end of the Fair, near Fort Mason (then an active Naval station, now a center for non-profit organizations) was The Zone, an avenue of popular amusements and concessions stands. Constructed from temporary materials (primarily staff, a combination of plaster and burlap fiber), almost all the fair's various buildings and attractions were pulled down in late 1915. Intended to fall into pieces at the close of the fair (reportedly because the architect believed every great city needed ruins), the only surviving building, Bernard Maybeck's Palace of Fine Arts, remained in place, slowly falling into disrepair (although the hall used to display painting and sculpture during the Fair was repurposed as a garage for jeeps during World War II). The Palace, including the colonnade with its signature weeping women and rotunda dome, was completely reconstructed in the 1960s and is currently occupied by the Exploratorium, an interactive science museum. The US Post Office issued a set of four postage stamps to commemorate the exposition, with designs depicting a profile of Vasco N��ez de Balboa(1�), the Pedro Miguel Locks of the Panama Canal (2�), the Golden Gate (5�), and the discovery of San Francisco Bay (10�). The stamps were first put on sale in 1913, to promote the coming event, and perforated 12, and then reissued in 1914 and 1915, perforated 10. Their prices today range widely; the 2� of 1913 is available for under a dollar (USD) in used condition, while an unused 10� of 1915 goes for a thousand United States dollars. Postcard showing new buildings in San Francisco, with earthquake ruins and bear in foreground, and two small images of buildings of the Exposition at bottomCommemorative coins were also issued. The United States Congress authorized the San Francisco Mint (also known as "The Granite Lady") to issue a series of five commemorative coins. Said coins were the 1915S silver Panama-Pacific half dollar and four gold coins. The denominations of the gold coins were 1 dollar, 2� dollars (quarter eagle), a 50 dollar round coin, and an unusual 50 dollar octagonal coin. Legendary numismatist Farran Zerbe supervised the creation of a series of commemorative medals, an award medal, a souvenir medal, and diplomas. The half dollar, with a mintage of 27,000, can be purchased in midrange circulated condition for less than $500 as of 2006, but pristine specimens are considerably costlier. The gold $1 with a mintage of 15,000 pieces sells in the same range while $2.50 pieces with a mintage of 6,749 pieces are more expensive, with worn pieces costing in excess of $1,000, while the round and octagonal $50 coins sell for multiple tens of thousands of dollars in any condition. With a mintage of just 483 the round $50 coin has, in fact, the lowest mintage figure of any official U.S. mint issue of the 20th century. At the Fair these five coins were sold both individually and in framed sets. Not surprisingly, few were purchased. The Pan-Pac coins have the distinction of being the first commemorative coins to bear the motto "In God We Trust", and were also the first commemoratives to be struck at a branch mint. Among the exhibits at the Exposition was C. P. Huntington, the first steam locomotive purchased by Southern Pacific Railroad; the locomotive is now on static display at the California State Railroad Museum in Sacramento. A telephone line was also established to New York so people across the continent could hear the Pacific Ocean. The Liberty Bell traveled by train on a nationwide tour to and from Pennsylvania to attend the exposition. After that trip, the Liberty Bell returned to Pennsylvania, never to be moved again.